Yet again, looking for something else entirely, I came across this article from the Auckland Star, 29 March 1939. Fire destroyed an unoccupied four-roomed wooden dwelling in Munster Road, Avondale, shortly before three o'clock this morning. The building belonged to the estate of the late Mrs M A Irvine, and was insured for £200. When the alarm was given from a street box some distance away from the blaze, the glare of the flames could be seen over a wide area, tongues of flame from the dry wood leaping high into the air. The Mount Albert and Mount Roskill fire stations answered the call, but when the brigadesmen arrived nothing could be done to save the building, which was a mass of flame. It stood in an isolated part of the district and was some distance back from the road. No water was available, the nearest main being over 500 yards away. The house, one of the oldest farmlet buildings in the district, had been empty for some time and contained no furniture. It is believed that the outbreak was caused by the wind carrying sparks from the grounds where stumps were being burned out. I wondered where in Avondale this fire had happened, in a place so remote that watyer supply had not yet reached it by 1939. So, first I ascertained where Munster Road is. 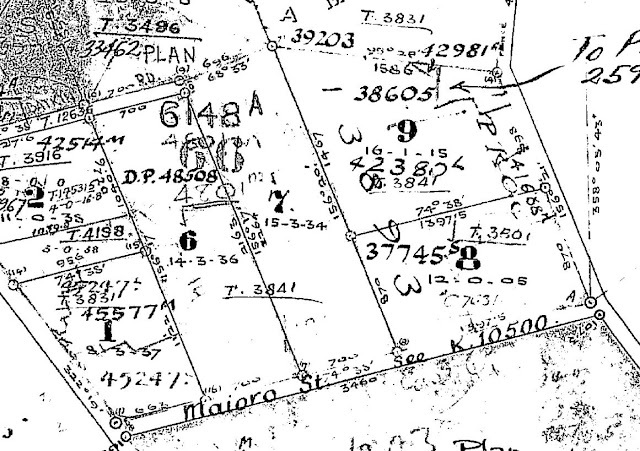 Fortunately, a previous post here on the blog gave me the answer -- it's Maioro Street today (or, more properly, Maioro Street West, as a new extension over Richardson Road now exists, leading to State Highway 20). So, where on Maioro Street? That involved a bit of trawling through LINZ survey plans for the road and surrounds. Maioro Street started out as East Street, the eastern-most extent of the old Avondale Road Board and Borough Council area. Most of the development for housing along that stretch started from the 1950s, so that would explain the description of isolation for the farmhouse in the article. No. 8, 12 acres, 5 perches. No. 1 later came to be owned by the Dickey family from Penrose around 1918. Nos 6 and 7 were further subdivided in 1910. That left No. 8. In November 1881, a butcher named Robert Perkin Pasco purchased the 12 acre farmlet. What he did with the land is not known. Possibly, he simply leased it out for income. The old farmhouse may well have dated from that time. Tight financial times with the Long Depression saw Pasco put the land in the name of his wife Louisa in 1887, but this move, in the face of mutiple mortgages outstanding on the property, proved futile. One of the mortgage holders from 1884, John Campbell, took control of the title and sold the land in 1892 to Elizabeth Ellen Kelly, wife of carpenter William Alexander Kelly. The Kellys sold the property in 1900 to Devonport builder, Albert Edward Brookes. He used the property to take out a number of mortgages, before he died in 1906 and his widow, living in Mt Albert, inherited the site. In 1912, she sold the property to another widow: Margaret Amelia Irvine, the "M A Irvine" mentioned in the 1939 article. The property was inherited by William Johnston Irvine, settler, and spinster Mary Amelia Annie Virginia Irvine, both from Mt Roskill, in 1928. Six acres were taken for state housing in 1953, some more for post and telegraph purposes, some for roading, and some, oddly, for a railway. A cul-de-sac called Cordelia Place was formed and dedicated in 1961, and it is there, at the end of Cordelia Place, in the front yards of nos 7 and 9, where I think that burned-out old farmhouse had once stood, judging by the 1940 aerial photographs available of that area.